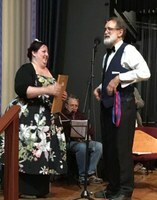 Norm Ellis presenting 2017 Dance Comp. winners with their Trophies, during the Sunday night Ball, at the Bundanoon DanceFest w/e. Kathy Potter: "The Yarralinka" & Peter Gamble: "Mary's Lament".